When do you become an elder? What does it mean to become an elder? Does someone assign that position to another individual? Is it due to the age of the person? Or is it based on the wealth of knowledge an individual accumulates over a lifetime? Often, Indigenous tradition also emphasizes the importance of making eye contact with elders as they speak. An excellent paper titled The Invisible Elder: The Plight of the Elder Native American was written by Lora A. Kaelber. In it, she discusses how elders have had many struggles and that those struggles are still a tremendous burden today. For example, she writes that elders, who were once revered and the center of tribal life, are often bypassed from their positions and struggle for a better life and sense of dignity. Elders, she points out, have had to contend with the relationships with the federal government including the many sacrifices that Native Americans were compelled to do. In 1819, Congress passed the Indian Civilization Fund Act, one of the first acts that tried to assimilate Indians. It provided financial support to missionary groups willing to provide for “moral” education of American Indian children. In 1830, a policy relocated Native Americans to Oklahoma by privatizing the land and giving Indians “allotments.” Not only did the Indians have to cope with displacement, but they also had to deal with widespread disease. Because of this, in 1849, the Bureau of Indian Affairs was created. During the late 1800s, the struggles for health and territorial sovereignty were of utmost importance. What were the elders teaching of culture and wisdom during this chaotic period of their transition? In 1924, the Indian Citizenship Act (ICA) was enacted to again assimilate Indians into “New” Americans. In 1934, the Indian Reorganization Act which was designed to affect an orderly transition from federal control to native self-government. Thus, in 1956, Congress passed the Indian Relocation Act, in which, if the government could not force assimilation, they could pay for it. In 1968, the Indian Civil Rights Act (ICRA) gave Indians the right to sue the federal government. Then, in 1975, the Indian Self-Determination Act (ISDA) permitted tribes to administer a full spectrum of Indian health care programs. Under the ISDA, some control over tribal governmental affairs was given back to the tribes. There also is the Indian Child Welfare Act and the American Indian Religious Freedom Act. Elders are very important in the development of our nation’s progress. Elders, for a short period, had been somewhat MIA due to being Native Americans living in a European society. There were no written laws among the early Indians. However, you can see how elders reacted to the bombardment of all the different treaties and Congressional Acts that had to be honored by Native Americans but were not honored by the federal government. 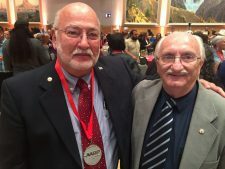 David Barrett and District 9 Legislator Paul Wesselhöft. 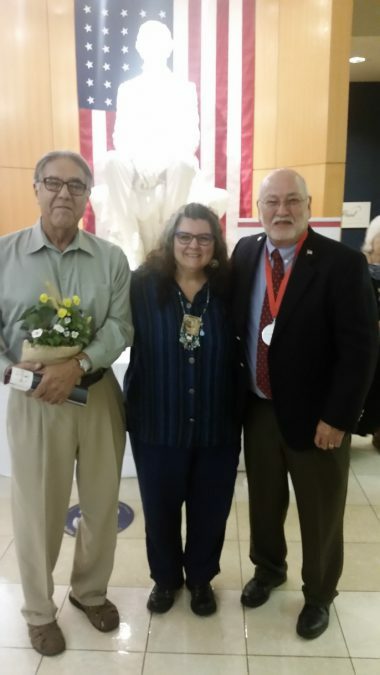 AARP hosted its ninth annual Oklahoma Indian Elder Honors program Oct. 3 at the National Cowboy and Western Heritage Museum in Oklahoma City, where 50 elders from all of Oklahoma’s 39 tribal nations were celebrated. Yes, I was one of the 50, but while I listened to the other 49 honorees, my mind was consumed by the stories about lives, what each has contributed to their nation and how their lengths of service (while an elder) meant to each tribe. Also honored were current CPN employee Burt Patadal (Kiowa) and former Director of Health Services Tim Tallchief (Osage Nation). Judge Phil Lujan, Laura Hewuse and David Barrett. All the elders had one common thread: service to Native Americans. They are language teachers; tribal government leaders, committee members, tribal officers, artists, native dancers, designers, pastors and even world-champion archers. They promote health; preserve tribal history and culture; work to reduce drug and alcohol abuse and addiction, mentor generations of youth; protect the safety of communities, families and children; and serve the United States as military servicemen and servicewomen in conflicts like the Battle of the Bulge, World War II and Vietnam. Yes, the tribes are on a comeback. In many cases, they scarcely resemble tribes of two centuries ago. Citizen Potawatomi Nation is working hard to create more knowledge, wealth, communities, excellence, pride, health services, educational grants, language and dance, and regain identities for all our members. Thanksgiving is this month, so reward another person by thanking them with kind words of appreciation. Comment to them what a joy and blessing they have brought into your life from knowing them. Unity will always win out against division of diverse people. I always hope to have research in a manner that the statements I have made are factual to the best of my ability. 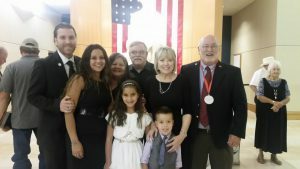 Chad Barrett, Christi Barrett, Jeneva Slavin, Tommy Slavin, Connie Barrett, David Barrett, Eastyn Barrett, and Kyla Barrett attended the AARP event to honor David Barrett. It goes without saying, thank you for allowing me to represent you and our great nation.